In 1986, he moved to Jerusalem to study Torah, and has remained there ever since – aside from a two year stay in New York, during which he received an M.A. in Jewish Education from Yeshiva University, graduating with honors. In 1996, he received Rabbinic Ordination from R. Zalman Nechemia Goldberg, a member of the Jerusalem Beit Din, and in 2005, he received a Ph.D. in Jewish Philosophy from Bar-Ilan University. His doctoral thesis is on the teachings of Rabbi Nachman of Breslov, and the nexus of language, mystical experience and eros found in the writings of this great hasidic master. He has taught at numerous institutions around Israel. Most notably, Bat Ayin Yeshiva, in Gush Etzion, the Rothberg School at Hebrew University, Jerusalem, the Overseas Program at Bar-Ilan University, Michlalah Jerusalem, and the David Cardozo Academy. He writes on topics of Jewish spirituality, and his articles have appeared in Parabola Magazine, Sh’ma, HaModia, and other publications. From 1991 until 2000, he edited and published Bas Ayin: A Journal of Jewish Spirituality, which was distributed free worldwide. 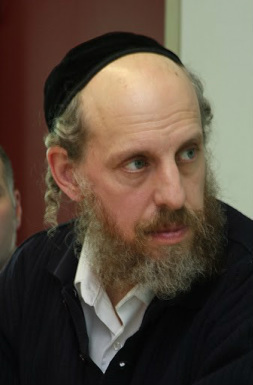 From 1998 until 2001, he edited the Orthodox Union’s popular Pardes Project, under the direction of R. Yaacov Haber. He is also a dynamic storyteller, whose original tales and retellings have appeared in anthologies and have been read over international radio. In 1997, he founded the Jerusalem Storytelling Circle, as well as delivered weekly stories on a local, Jerusalem radio station. He lives in the Ramat Eshkol neighborhood of Jerusalem with his wife and children. Please follow this link to download his current c.v.